Most Christians are familiar with the Bible verse that says that Damascus will become a ruinous heap. 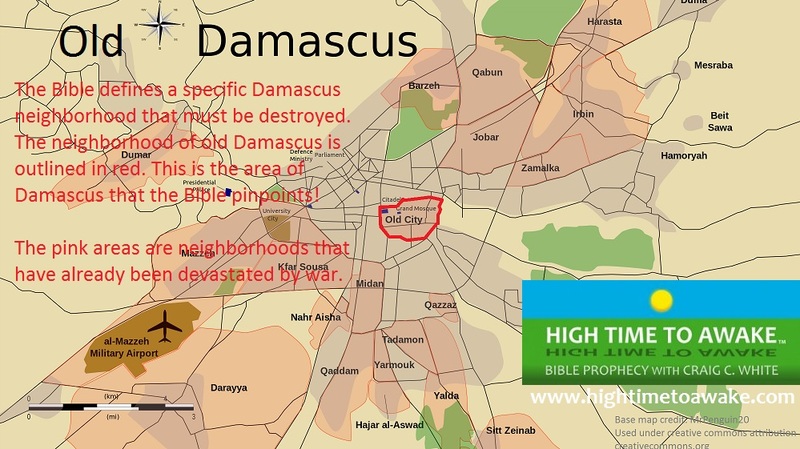 But the Bible defines a specific Damascus neighborhood that must be destroyed. Has Damascus already become a ruinous heap? Some outlying neighborhoods have. But the central core of Damascus remains relatively intact. Does this satisfy Bible prophecy? Not yet. Jeremiah chapter 49 identifies the neighborhood of Old Damascus with its Old buildings and ancient renown. Two different Hebrew words for city are used in the verse above. The city of praise is a fortified city that has been celebrated in song. When God says “how is the city not left” he could be communicating his astonishment that even after a terrible assault on Damascus, the city has still not surrendered. When God calls Damascus “the city of my joy!” he is specifically saying that he delights in the cities old buildings. So we are looking for the destruction of the old part of the city. The neighborhood of Old Damascus is the seat of Syria’s government as well as its center of ancient history. Damascus is the oldest continually inhabited city on earth. It was founded by the Aramaeans over four thousand years ago, and was inhabited two thousand years before that. Damascus is a living depiction of human history. Map of Damascus with the neighborhood of old Damascus outlined in red. 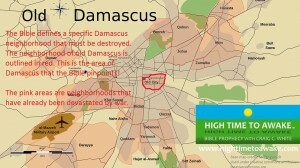 This is the area of Damascus that the Bible pinpoints! After you view this video you will understand that the Bible does not require Damascus to be destroyed by a nuclear bomb as so many Bible prophecy buffs teach.